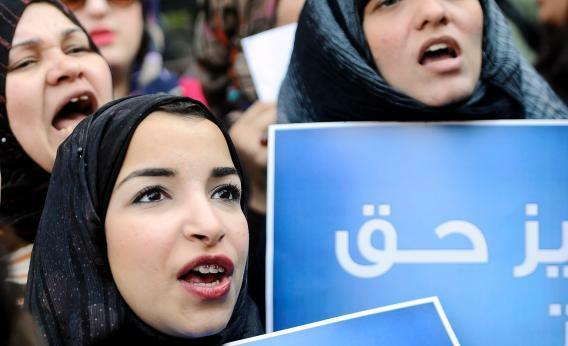 Egyptian women shout slogans during a protest against the military council violations and virginity tests on women, outside the State Council court in Cairo on December 27, 2011. As part of our ongoing “Broadly Speaking” series with the New America Foundation, DoubleX is co-hosting an event this Tuesday, Jan. 10th in New York City. The topic: Islamic feminism. The discussion will focus on the aftermath of the Arab Spring and what it means for women and feminism in the Middle East. The panelists—NAF’s Katherine Zoepf, Egyptian-American journalist Mona Eltahawy, Isobel Coleman, the author of Paradise Beneath Her Feet: How Women Are Transforming the Middle East, and Saudi journalist Ebithal Mubarak—will also talk about how feminism and Islam can be reconciled. The panel will be held at the New America Foundation’s event space in SoHo. For full details and to sign up for this free event, click here. We hope to see you there!